Bo Butner celebrates Las Vegas win. As the 2018 season of NHRA's Mello Yello Drag Racing Series wound down, 2017 Pro Stock world champion Bo Butner made a decision to shift gears and step back from the class. The longtime Sportsman racer elected to return to his roots and spend more time with his growing family, but when an abbreviated schedule was announced for Pro Stock, Butner and company had to think twice. With the support of his family, Butner will return to tackle the 18-race Pro Stock tour in 2019. He also remains committed to competing in the SAM Tech Factory Stock Showdown in his Cobra Jet Mustang. When rumblings of 18 races rather than the full 24 for Pro Stock began to surface, it was Butner's mother, Dottie, who began to question the decision to leave the Professional-level naturally aspirated factory hot rods behind. "She shocked me and said that maybe we should keep doing this, and I told her I thought it was time to move on; we'd already been successful with the best team out there," said Butner. "But I did say I'd think about it." Butner went home after the last race of the 2018 season and discussed the idea with his son, JB Butner, the General Sales Manager of Jim Butner Auto Group in Clarksville, Indiana. JB and his wife, Elizabeth, are expecting a baby in April of 2019 – Butner's first grandchild and one of the leading factors in his initial decision to scale back from a 24-race commitment. "JB runs the dealership, so it was important to make sure he was on board with it. And of course, when his baby is born in April, I want to be there for that, even if I have to miss a race," said Butner. True to their roots, Butner's fiancé, Randi Lyn Shipp, will continue to race Stock Eliminator at the national event level, and Butner's participation in the SAM Tech Factory Stock Showdown will take shape as the year goes on. "The Factory Stock Showdown is a great deal, and I'm looking forward to racing in it. 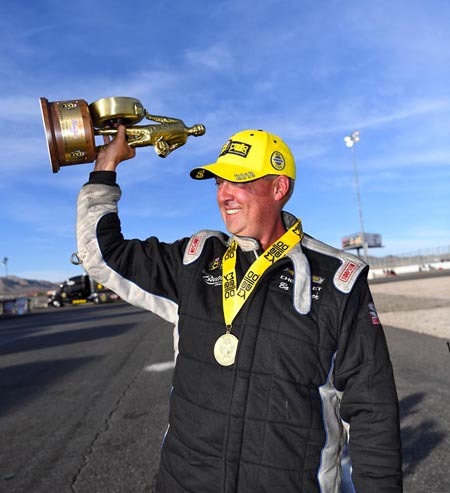 If we have a shot to win that championship, of course we'll take it," said Butner, who has earned multiple division championships and the 2006 Competition Eliminator world title in addition to his Pro Stock championship. 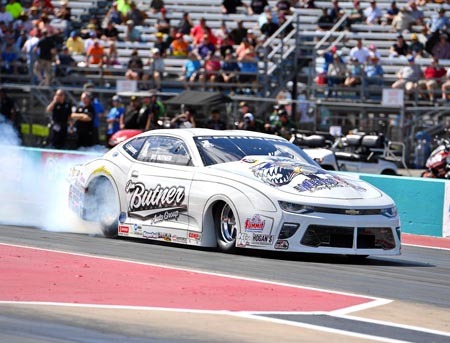 When Butner initially decided to detour from Pro Stock, he said that he would only ever return with KB Racing. He's holding true to his word. "It tore at my heart to think about something happening to this class or it going away, and that's another reason I wanted to come back. So we sat down and talked with KB Racing on Sunday afternoon in Pomona," said Butner, who has claimed a total of seven Pro Stock wins with the esteemed group since launching his Pro Stock career in Gainesville in 2015. "They were supportive, and Ken and Judy Black said that any time I ever wanted to come back, I'm welcome. We're all like a big family." Summit Racing Chevrolet Camaro driver Greg Anderson, who put KB Racing together with team owner Ken Black in 2002, was elated to learn of Butner's planned return. "We're excited," said Anderson. "Bo is like family to us, and we've had a great run together the last few years. We've had a lot of fun, and he's a heck of a racer. We hated to see Bo leave the class, and it's great to see him come back. Not just for KB Racing, but for Pro Stock." Butner will likely remain in the same KB Racing-owned Jerry Haas-built Chevrolet Camaro that he drove last season, and the calls on his car will be made by his crew chief Darrel Herron, along with KB Racing's Tim Freeman. Tyler Hogan, of Hogan's Manifolds, will return, as will Jack Line [Team Summit driver Jason Line's son], as school permits. "I think everything is going in the right direction with this team. Everyone at KB Racing is pumped up and working hard," said Butner. "I'm excited to get back to it."